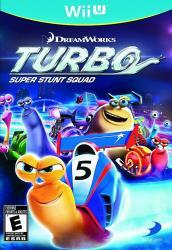 Turbo: Super Stunt Squad is a high-velocity action game featuring the super-charged crew of characters from the upcoming film. Each playable character has their own signature street style and tricked-out skills which will come in handy when showing-off and earning respect with super-cool stunt moves. Expert skills will also prove useful to earn power-ups, customize your character, win competitive challenges and discover shortcuts in the dynamic larger-than-life environments of Turbo�s world.